In the backwoods of Canada, Dennis Bennett, set a new world record after downing a non-typical mule deer with a bow and arrow in the Arm River area of Saskatchewan on Oct. 1, 2018. Bennett, a bow hunting member of the Saskatchewan Wildlife Federation (SWF) shot the Mule Deer that measured in with a score of 291 and 1/8 on the Pope & Young scoring system, earning him the new world record for non-typical mule deer. 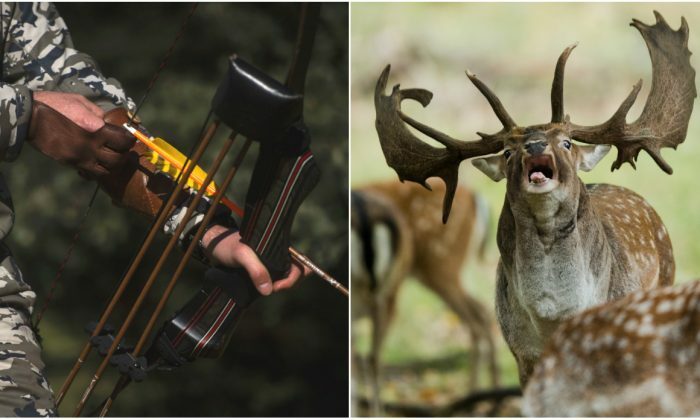 The Pope & Young Club’s Record Program is only for animals that have been taken by the use of bow and arrow, and measures the antlers, horns, or skulls of certain wildlife that have to go through a drying period with a minimum of 60 days. The trophy antlers were also measured on the Saskatchewan Henry Kelsey Big Game Records System, which uses the green score and does not require a drying period, also having minimum score requirements. Official Henry Kelsey measurers declared the non-typical Mule Deer antlers a provincial record on Oct. 7, 2019. Scoring the antlers 293 and 6/8, meeting the minimum score of 200, and surpassing the previous Henry Kelsey record of 290 earned by Nelson Clark in the 1920s. Pope & Young and Henry Kelsey both use the Boone & Crockett scoring method (pdf), measuring the length of the main beam and different points and circumferences of the antlers. Some of the rules (pdf) in the fair chase philosophy include not killing animals helpless in a trap, deep snow, water, or on ice, not hunting from a powered vehicle or boat, not using lights to blind and immobilize, not using tranquilizers or poisons, not hunting inside escape proof fenced-off enclosures, not spotting from the air or communicating with airborne assistants, and not using electronic devices for attracting, locating, or pursuing game. Another rule of fair chase is bow hunters are not allowed to use any electronic add-ons to their bows that aid in range finding, sights, or firing of the bow. The only exceptions being lighted nocks and recording devices that don’t cast any light towards a target. According to the Pope & Young website, the fair chase concept extends beyond the hunt. It is also an attitude and theme based on deep respect for wildlife, the environment, and other individuals. According to a Pope & Young news release on Jan. 19, Bennett was scouting the Arm River area early on the morning of Oct. 1, 2018, when he spotted the large non-typical Mule Deer and got within 44 yards of the animal. The deer was spooked when another smaller buck that was bedded nearby was alerted, causing both deer to run away uphill and into the trees. Later that afternoon, Bennett returned to the area where he had spotted the huge buck and found it close to where he had first seen it that morning. The buck was sitting near the top of the hill, and thanks to a change in the wind and circumstance, Bennett was able to follow the fence line at the hilltop to get within 37 yards. With the buck now standing at a perfect angle for the broadside shot, Bennett took aim and ranged in the buck that was feeding on brush. Bennett said the shot hit a little high as it was on such a steep angle, dropping the deer which then rolled down the hill approximately 50 yards. Recently in November, hunter Keith Szableswki downed a deer in Williamson County, Ill., that may be the largest ever shot in the United States. It will be scored during the Illinois Deer and Turkey expo in July this year. Szableswki donated most of the meat to people in need. In November 2017, hunter Stephen Tucker got a potential world record Whitetail Deer in Sumner County, Tenn. with a 47 point rack, that will be scored this year at the Boone and Crockett awards banquet. A man in Tennessee set the world record for largest whitetail deer ever killed. These cases were performed ethically and legally, which isn’t always the case as poachers are sometimes caught by conservation officers and held accountable. Such as Josiah Killingbeck of Michigan, who blamed his wife for his poaching, saying she would be angry at him if he returned home without deer meat, and David Berry Jr. of Southwest Missouri, who was found guilty of killing several hundred deer over a period of three years, taking only the heads and leaving the bodies to rot. Berry was ordered by a judge that he must watch the Disney movie Bambi once a month during his one year sentence.